The most difficult items to move from home to home are your appliances, which is often why many real estate transactions include them as part of the cost of sale. That said, when you want to take your appliances with you, a little planning will go a long way in helping you move while also mitigating stress often associated with the moving your appliances. Consider these five tips to help you move your appliances. Not only will it be easier on you physically and mentally, but it will also help to protect your floors, the walls, and the units themselves from damage. The first thing you should do is measure the size of your appliances to see if they will fit through the door. In some cases, you may need to remove the door to get clearance or bring the appliance in through a larger frame such as a sliding glass door. Once you have the dimensions and planned out the move, you can proceed to preparing the space and the appliances for the task. Cleaning the floors is one task that should not be overlooked. Dirt, stones, or other foreign objects can damage your floors more than the appliances themselves. Vacuum, sweep, or mop the area where you will be bringing in the appliance. Once there are no foreign objects in the area, you can put down a protective covering where you will be moving the appliances. While you can use cardboard to protect a clean floor, it is the least effective way. Cardboard has a tendency to move and create friction on the floor as you walk on it which can create tiny scratches, especially in hardwood. A much better way to protect your floor is to use leftover carpet pieces or runners. For the best protection, invest in some temporary flooring. When used properly on a cleaned floor, these methods will mitigate any potential for damage. Fridge: Remove food and place it in a portable cooler. Unplug the fridge and clean it unit inside and out, leaving the door open to air for 24 hours to remove moisture. Then tape or wrap the door shut to prevent the door from swinging open. You may also need to remove the handle to fit your space. Place the handle inside the fridge or tape it to the exterior so it won’t get lost. Stove: Turn the power off, remove racks and surface grates, clean the exterior. Secure the knobs and tape or wrap the door shut. Dryer: Turn the power off, clean the lint screen, and clean the exterior. Then simply tape or wrap the door shut. Washing machine: Disconnect the power and the input/output hoses. Leave the door open to air for 24 hours to remove moisture, then secure the hoses to the unit. Finally, tape or wrap the door shut. Dishwasher: Power the unit off and disconnect the input/output hoses. Leave the door open to air for 24 hours to remove moisture, then secure the hoses to the unit. Finally, secure the internal racks and tape or wrap the door shut. Moving your appliances is not an easy task, so one of the most important things you can do to simplify your move is to ask for help from friends or family. Having more hands on deck will enable the load to be distributed more widely. Having fresh arms will make the move safer and easier. You should also invest in quality equipment such as dollies, hand trucks, gloves, proper footwear, and comfortable but not loose-fitting clothing. Now that you are excited about your move, and you have properly prepared both the space and the appliances, you are ready for the easiest (and hardest) part: the physical labor. 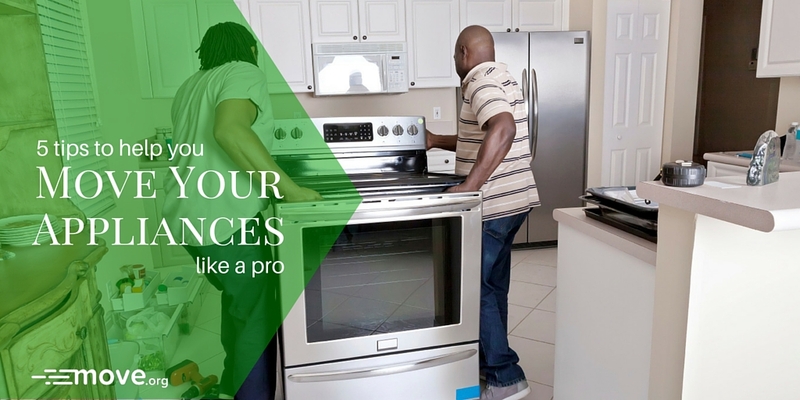 With confidence, you will be able to move fridges, stoves, washing machines, washers, and dryers into your new place, knowing that your floors, walls, and appliances will be in the same condition as they are now. If you’re still apprehensive about moving appliances yourself, there are plenty of moving services that will send movers to get your appliances situated in your new place. All that’s left to do is get your appliances set up and enjoy your new home. After all, you’ve earned it. Zach is a content creator that has been featured in the Toronto Star, Wall Street Journal, Forbes, Marketing Magazine and many others, covering topics such as real estate, social media and influencers.